Tudor Roof Tiles is pleased to have been chosen to supply roof tiles for the Church Of All Saints recent roof upgrade. The church dates from the 13th century with refurbishments and a new chancel added in the 19th century. 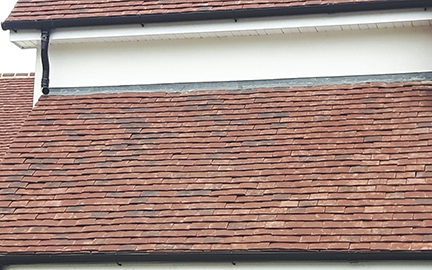 The Tudor tiles feature a mix of Sussex Brown colour plus Weathered Earth colour. Bat access tiles have also been included during the re-tiling work. Many thanks to all those involved in helping to preserve this historic building. What makes Tudor roof tiles ? HANDS make Tudor Roof Tiles! Tudor handmade roof tiles – colour mix. 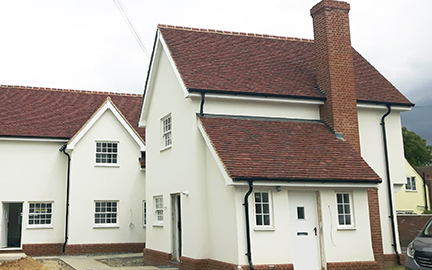 Lovely house in Essex with Tudor handmade roof tiles. 75% Red Antique and 25% Dark Antique colour mix. Make Your Roof Unique – create your own colour mix. Another merchant has asked George at Tudor Tiles to erect a permanent display in their yard. Its hard to believe but the 6 most popular colours of Tudor tiles still include 5 colours dating back to the formation of the Company. Jubilee was introduced on Tudor’s 25th birthday. Proudly powered by WordPress | Theme: trtblog by Paul John Lythgoe.